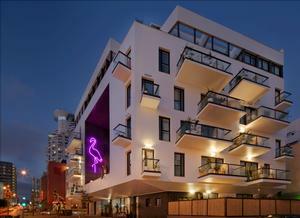 The new BROWN URBAN BEACH HOUSE hotel in Tel Aviv marks the arrival of Tel Aviv's leading contemporary boutique hotel brand, the BROWN, to the city's coastal area, currently dominated by large chain hotels. It is for those who want to experience an authentic Tel-Avivian hospitality, without distancing themselves from the beach. Introducing contemporary boutique hospitality to the area. the hotel offers 40 extra-spacious rooms and suites featuring private sun terraces with sea and city views, 24 hours concierge, a viby bar, a Kosher hi-end cafe-restaurant (opening September 2015) , spa and business facilities, all within a one minute walk of the city’s famous beaches. The Beach House is located 1 min walk away from Tel aviv's Jerusalem beach, on the corner of Ha'yarkon, Trumpeldor and Nes-Tziona streets. It is where the beachside environment transforms into urbanity, easy walking distance from many of the city's hotspots such as the Carmel Market, Dizengoff Center and the Meir Park. But the easyest proximity of this location is of course the beach, only one street away, with it's beautiful promenade and endless holiday vibe.